The Recent Items stack can display recently used applications. Screen shot courtesy of Coyote Moon, Inc. The Dock is one of best features of OS X and macOS. It puts applications and documents at your fingertips, where you can access them with a click of the mouse. But what if an application or document is one that you don’t use often enough to deserve its own space in the Dock? For example, I often make heavy use of an application for a day or two, and then rarely use it again for several months. It certainly doesn’t deserve to take up dedicated space in the Dock, but it would be handy to be able to access it quickly during those few days I’m using it heavily. I could of course just drag the app to the Dock when I need it, and then remove it from the Dock when it is no longer needed, but that is a lot of work, and I would probably end up forgetting to remove the app and end up with an over populated Dock. Another method of accomplishing this goal is the ‘Recent Items’ Apple menu item, which provides easy access to recently used documents, applications, and servers. But if you’re Dock-oriented like me, you might wish you could access the Recent Items option through the Dock instead of the Apple menu. Fortunately, it’s both possible and easy to customize the Dock by adding a Recent Items stack. Not only will this stack keep track of applications, documents, and servers you’ve recently used, it will also track volumes and any favorite items you’ve added to the Finder sidebar. The Recent Items stack is so versatile I’m surprised Apple didn’t include it as part of the standard Dock. OS X 10.5.x. This tip works with OS X 10.5.x and later version of OS X. The willingness to use the Terminal application to customize the Dock. The Terminal application gives you a command line interface to the underbelly of OS X. Enter the following text into Terminal. You can copy/paste the following line into Terminal, or you can simply type the line as shown. The command below is a single line of text, but your browser may break it into multiple lines. Be sure to enter the text as a single line in the Terminal application. Tip: Triple click the text to select the full command line. After you enter the line above, press enter or return. The Dock will disappear for a moment and then reappear. Your Dock will now have a new Recent Items stack located just to the left of the Trash icon. If you click on the Recent Items stack, you will see a list of your most recently used applications. Click the Recent Items stack again to close the display of recent applications. But wait; there’s more. If you right-click on the Recent Items stack, you will see that you can choose which recent items should display. You can select any of the following from the menu: Recent Applications, Recent Documents, Recent Servers, Recent Volumes, or Favorite Items. If you would like to have more than one Recent Items stack, repeat the terminal commands listed above under ‘Let’s Get Started.’ This will create a second Recent Items stack, which you can right-click and assign to show one of the recent item types. For instance, you could have two Recent Item stacks; one showing recent applications and the other showing recent documents. Beside selecting which type of recent item to display, you can also choose the style that will be used. Fan: Displays the recent items as thumbnails arrayed in an arc above the Recent Items Dock icon. Grid: Shows the Recent items as large icons in a grid array above the Dock. 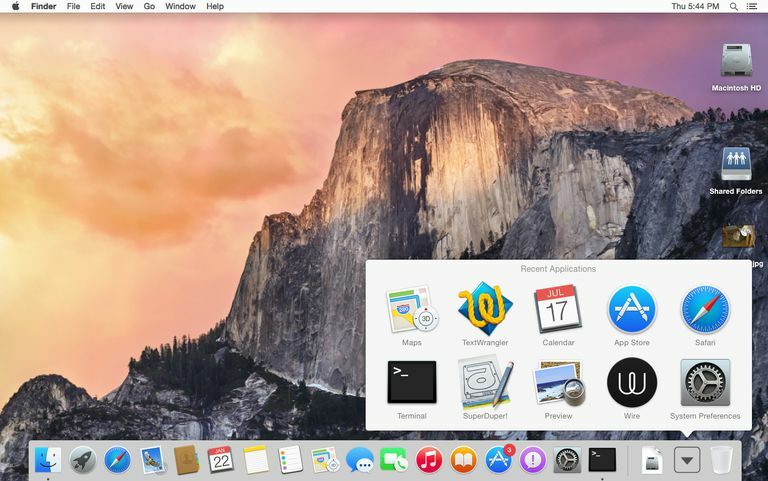 List: Displays the Recent Items as a list within a popup menu above the Dock icon. Automatic: Will display the Recent Item content in the best style based on the number and type of content in the Recent Item list. If you decide you don’t wish to have a Recent Items stack in your Dock, you can make it disappear by right-clicking on the stack and selecting ‘Remove from Dock’ from the pop-up menu. This will remove the Recent Items stack and return your Dock to the way it looked before you added the Recent Items stack.